U.N. Secretary-General Ban Ki-moon has nominated Mexican diplomat Patricia Espinosa to be the new head of the U.N. Framework Convention on Climate Change. 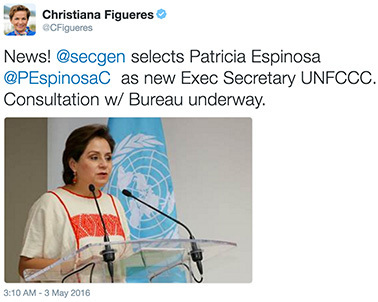 Espinosa's selection was confirmed in a tweet today by current U.N. climate chief Christiana Figueres, who is set to step down this summer after helping to land last year's landmark Paris Agreement. It will now be Espinosa's task to start implementation of the deal, which could take force as soon as this year. U.N. climate chief Christiana Figueres announced the news of Patricia Espinosa's appointment to the top spot at the U.N. Framework Convention on Climate Change this morning in a tweet. The Mexican diplomat won high praise for her work as president of the 2010 round of U.N. negotiations in Cancun, which helped recover ground after the processes nearly collapsed the previous year, when a summit in Copenhagen, Denmark, failed to produce an agreement. Several other candidates were considered for the role, including Laurence Tubiana, France's ambassador for climate change, who had a hand in last year's successful conference in Paris. In a post on Twitter this morning, Tubiana called Espinosa "a powerful woman for an exciting and challenging period." Activists online cheered the selection and said Espinosa showed strong leadership of U.N. climate talks in Cancun in 2010. "Espinosa is fantastic. I hugged her, hard, in 2010 when she lifted the UN out of the disappointment of Copenhagen," tweeted Zoë Caron, a policy adviser to Canadian Prime Minister Justin Trudeau. Bill Hare, head of Climate Analytics, a consortium of scientists and policymakers, called her a "great appointment to guide implementation of #ParisAgreement."